Even with an aggressive maintenance and repair program, landlords know that things break and wear out. To maintain resident satisfaction, you need a system that enables residents to submit maintenance requests and then respond to those requests effectively and in a timely manner. Making sure that your residents have plenty of opportunities to let you know about any maintenance and repair needs they discover during their tenancy is good business. 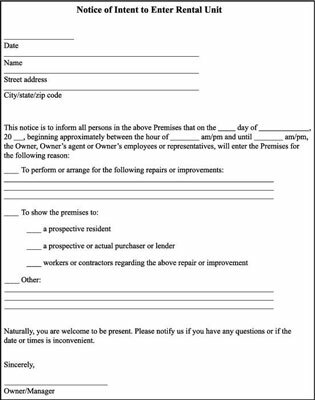 Whenever possible, when you have contact with your residents, either orally or in writing, check to see if they have any repair requests. 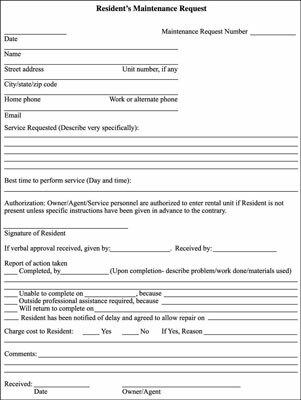 If you have a website, consider creating a maintenance request form that residents can complete and submit online for their convenience. Email is also an excellent way to receive and respond to your residents. Be sure to keep hard copies in the tenant’s files as evidence to support you in case there is ever a claim that you failed to properly maintain the premises or respond in a timely manner. In the best of all possible worlds, landlords would respond immediately to maintenance requests, but such quick response isn’t always realistic. Respond to urgent matters immediately and to non-urgent matters within 48 business hours. If you can’t perform the repair within 48 hours, call the resident to let them know when he can expect the repair to be completed and the reason for the delay.